Background Corneal graft (CG) surgery is the most common and successful tissue transplant worldwide. A small and important group of patients are operated in emergency situations, typically to save a perforated eye. Our knowledge of the indications and outcomes of emergency corneal graft (eCG) is limited. Methods Retrospective, multifactorial analysis of all CGs registered by the UK Transplant Service from April 1999 to March 2005. Results A total of 12 976 CGs were performed. 1330 (11.4%) were eCGs including 433 regrafts. Actual perforation occurred in 876 (65.9%) patients. 420 (31.5%) grafts were for tectonic purposes alone and 217 (16.3%) were also grafted for visual rehabilitation. The main diagnostic categories were infection (39.4%), non-infectious ulcerative keratitis (32.2%) and other causes (ectasias, previous ocular surgery, injury, dystrophies and opacification). Graft survival of first eCG at 1, 2 and 5 years was 78%, 66% and 47%, respectively. Best-corrected visual acuity of surviving grafts at 1 year was: 6/12 or better in 29.9%, 6/18 to 6/60 in 38.4%, counting finger to LP in 30.6% and NPL in 1%, with worsening of vision in only 8.7% of the patients. Conclusion This study which is the largest of its kind shows that despite the seriousness of the critical corneal pathology and the surgical challenges that it poses, the outcomes of eCG are favourable with most patients keeping their eyesight and avoiding immediate rejection. These clinical outcomes show the value of eye banking facilities that are developed to support corneal tissue supply for eCG. Emergency keratoplasty is regarded as high-risk surgery in comparison to elective keratoplasty, with worse outcomes and higher postoperative complication rates; however, the evidence on the indications, risk factors for graft failure and outcomes of eCG is patchy. There are studies from USA,6 Australia,7 New Zealand,8 UK,9–11 Germany,12 France,13 Italy,14 Sweden,15 Israel,16 Turkey,17 Saudi Arabia,18 Taiwan,19 China,20 India,21 Canada,22 Hungary,23 Iran24 and Singapore25 that have either concentrated on a subtype of eCG or have small number of eCGs, usually grouped under ‘other’ indications. We present a retrospective study with the largest cohort of eCG patients by using the UK Transplant Registry, a database with over 30 000 patients. The data provide the indications, graft survival and outcomes of this procedure. Such knowledge would benefit patient counselling, clinical management and planning of eye bank services for eCG. We analysed data from all eCGs from April 1999 to March 2005 that were registered with UK Transplant Service, the UK’s matching and distribution service. eCGs are classified by using ‘reasons for grafts’: therapeutic (severe infection, threatened or actual perforation) as selected by the surgeons on the UK Ocular Tissue Transplant Record form. Records were submitted by the operating surgeon or doctors involved in the patients’ care at the day of the operation (routine CG registration) and at intervals of 1, 2 and 5 years thereafter until graft failure, loss to follow-up or death of the patient has occurred. Missing data were routinely sought by follow-up letter. Ethical approval was not required as the data are being routinely collected for such purposes. We analysed information on the graft procedure, indication for surgery, demographics, vision before and after surgery, rejection episodes and graft failure. Additional data include host and surgical factors that could affect outcome such as: the presence of tissue inflammation, infection, ocular surface disease, extent of vascularisation, glaucoma and other coexisting disease. Surgical factors analysed include suturing technique, graft–host trephine sizes and the development of postoperative complications as indicated in the UK transplant audit follow-up forms. All statistical analyses were performed using SAS V.9.1. Kaplan-Meier survival curves were used to illustrate univariate differences in graft survival, and a Cox regression model was fitted to investigate which factors affected graft survival. χ2 tests were used to investigate differences in categorical variables, and t-tests were used to investigate differences in continuous variables between emergency and all other CGs. To enable comparison of a homogeneous group, graft survival, rejection and visual acuity were limited to first eCG. Postoperative visual acuity and refractive data were limited to assessments between 8 and 16 months from the day of eCG surgery for 1-year outcomes and between 18 and 30 months for 2-year outcomes. A total of 12 976 CGs performed between April 1999 and March 2005 have been reported to UK Transplant Service, 11 646 (88.6%) of which were done under elective conditions and 1330 (11.4%) under emergency circumstances. Records were submitted by a total of 498 surgeons from 273 centres, approximately half of which were involved in eCG surgery (244 (48%) surgeons from 147 (54%) centres). All operation registration UK Transplant Service forms were returned, whereas the completion rate of follow-up audit forms was 90% at year 1, 85% at year 2 and 74% at year 5. Detailed information on transplants was not available prior to April 1999. The mean age of eCG recipients at the time of transplantation was 60 years (SD 20) compared with 56 (SD 22) for corneal grafts performed under routine conditions and varied from less than 1 year to more than 98 years (figure 1). Approximately equal numbers of women (51%) and men (49%) had received an eCG. The proportion of eCGs that were human leucocyte antigen (HLA) matched was only 3% (44/1330) compared with 7% (823/11646) for elective CGs. Recipients of 147 grafts (11%) were known to have died, and 84 grafts (6%) had been lost to follow-up. Two patients recorded as lost to follow-up had actually died. Age distribution of study patients. The emergency graft group was slightly older compared with other recipients, and the difference in age distributions was highly significant (p<0.0001). The median age was 64 years (IQR=47–76) for emergency-grafted recipients compared with 62 years (IQR=37–76) for all other recipients. Other recipients showed an initial peak in the 21–40 year olds, which was mainly due to the large number of patients with keratoconus in these age groups. Approximately 20% of emergency-grafted recipients were aged 40 or under, compared with 30% of other recipients. These were similar for both first-time eCG (897 patients, 67.4%) and repeat eCG surgery (433 patients, 32.6%). The main diagnostic categories for first eCG were infection (353 patients, 39.4%), non-infectious ulcerative keratitis (289 patients, 32.2%) and other including ectasias (7%), previous ocular surgery (5.7%), injury (4.1%), dystrophies (2.6%) and opacification (1.9%). For repeat eCG, the diagnostic categories were graft failure (230 patients, 53.1%) infection (84 patients, 19.4%), non-infectious ulcerative keratitis (61 patients, 14.1%) and other including ectasias (1%), previous ocular surgery (2.5%), injury (2.8%), dystrophies (1%) and opacification (0.7%) (table 1). Overall, severe infection (S), threatened (T) and actual (A) perforation were reported in 405 (30.5%), 379 (28.5%) and 876 (65.9%) patients, respectively. Of note, many patients had a combination of pathologies, that is, severe infection with threatened perforation, 84 (6.3%); severe infection with actual perforation, 15 (1.1%); severe infection with threatened perforation that perforated, 40 (3%); threatened perforation that perforated, 151 (11.4%). Additionally, some patients were operated with no visual expectation (for cosmetic and tectonic reasons) and only 217 (24.8%) were having good visual potential. The patients’ mean age at time of surgery per indication were: 59 (SD, 19) for severe infection, 54 (SD, 24) for threatened perforation and 62 (SD, 19) for actual perforation. There was significant age difference per indication when comparing threatened with actual perforation (p<0.0001), severe infection with threatened perforation (p=0.02) but not when comparing severe infection with actual perforation (p=0.9). The majority of eCGs were done with a full thickness penetrating keratoplasty (1132 patients, 85.1%) followed by deep anterior lamellar keratoplasty (6%) and superficial lamellar keratoplasty (4%), with other types of graft accounting for less than 5% of eCGs. Interrupted suturing was the most frequently performed suturing technique (82%), followed by continuous (9%) and mixed (7%). The size of most routine grafts was between 7.00 mm and 8.25 mm; 78% compared with 43% of eCG. Only 1% and 2% of routine grafts had a trephine diameter of less than 7.00 mm or greater than 8.75 mm, respectively, compared with 10% and 23% of eCG. The majority of eCGs were oversized by 0.25 mm (19%) and 0.50 mm (45%), with 19% same-size grafts and 4% oversized by more than 0.50 mm. A third of all emergency grafts were regrafts; 33% (433/1330) compared with 18% (2063/11646) of routine grafts. The main indication for these was graft failure, recorded in 53% (230/433) of redo-eCG compared with 74% (1520/2063) of the routine regrafts. The other diagnostic categories for repeat eCG were infection (19%), ulcerative keratitis (14%), rejection (7%) and endophthalmitis (1%). Of the 84 patients who were regrafted due to infection, 52 (62%) were for a bacterial infection. Most of the redo-eCGs had regrafts in the same eye while fewer eCG patients had previously received grafts in the other eye (33% compared with 18%, p<0.0001). The median best-corrected visual acuity (BCVA) improved from hand movements at the time of transplant to 6/24 (20/80) at 2 years. Most patients (81%) showed an improvement in distance VA following eCG, 11% had no change and only 8% of patients experienced deterioration in distance VA. 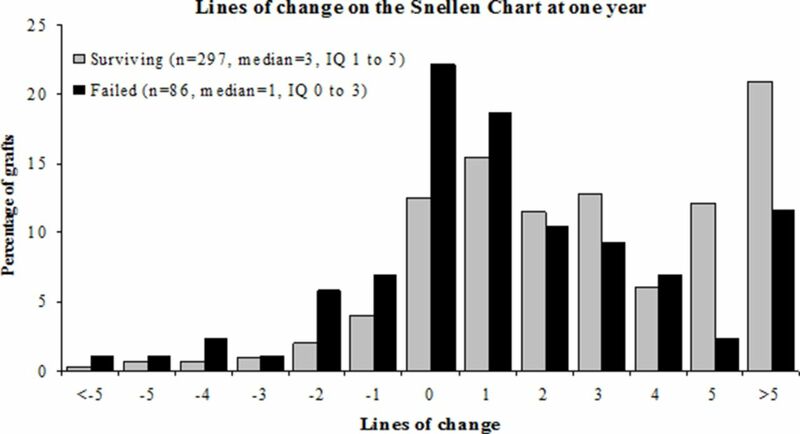 Figure 2 shows a graph with lines of improvement in the Snellen chart for cases who had completed 1-year follow-up with records of preoperative and 1-year postoperative BCVA. Lines of change on the vision at Snellen chart. Although uncorrected distance visual acuity was recorded for a large number of cases, only grafts with best-corrected visual acuity recorded in the UK Audit forms were included in this graph. Rejection episodes occurred in 28 (4%) eCGs, of which 24 (86%) went onto fail. The overall graft survival of first eCG at 1, 2 and 5 years was 78%, 66% and 47%, respectively with 88% of the grafts surviving the first year being alive at year 2. Table 2 shows the factors affecting graft survival for the first eCG. Compared with grafts for viral infection, eCGs performed for non-infectious ulcerative keratitis were 1.8 times more likely to fail at 5 years (p=0.03). Similarly, the prognosis for grafts with preoperative visual acuity of light perception (LP) or no light perception (NLP) was poorer than those better than LP; 1.8 times more likely to fail at 5 years (p=0.0005). eCGs where the graft size was 9.00 mm or greater were 1.6 times more likely to fail at 5 years, compared with grafts less than 9.00 mm in diameter (p=0.006). Patients with preoperative conditions that may affect visual acuity were 1.5 times more likely to fail than patients with no reported preoperative conditions (p=0.02). Gender match of male donor cornea to male recipient was an additional risk of graft failure; 1.7 times more likely to fail than female donor cornea to female recipients. The first successful corneal transplant into a human eye26 was performed over 100 years ago and since then the technique has evolved and become the most widely practised form of clinical transplant worldwide. CG surgery can be performed both as a planned elective operation and as an emergency. Elective CG is usually straightforward and its primary goal is to improve vision in patients who suffer with a stable eye condition like keratoconus, Fuchs’ corneal dystrophy, pseudophakic bullous keratopathy or a corneal scar. Although eCG is performed in patients with trauma, ulceration or a critical corneal thinning/perforation with the aim to restore the structural integrity of the globe with visual improvement, generally a secondary consideration. In patients with severe corneal infection, eCG surgery is also indicated to remove or decrease the microbial load present in the excised tissue. We found that the most frequent indication for eCG was infection. Subgroup analysis reveals bacterial, viral, acanthamoebal and fungal infections with an incidence of 20.8%, 11%, 2.7% and 2.1%, respectively. Previous studies on CG and therapeutic penetrating keratoplasty have shown a broad range of frequencies for bacterial (1.77%–40%),28 viral (2.19%–35%),29 fungal (0.19%–48.1%)30 and acanthamoebal (0.19%–13.9%)31 keratitis and a smaller number for descemetoceles,32 corneoscleral melting,33 trauma34 and repeat grafts.35 This variation may reflect a smaller patient number, too broad a definition/inclusion under ‘other diagnosis’ and the geographical and ethnic variability of these studies. The second most frequent indication in our study was sterile ulcerative keratitis (32.2%), which was either idiopathic (17.3%) or associated with rheumatoid disease (14.9%). Repeat grafts (433) were mainly performed for graft failure (53.1%), infection (19.4%) and ulcerative keratitis (14.1%). Survival of emergency corneal grafts according to indication. The percentage of graft survival for ectasias and dystrophies (n=57) was 78% (95% CI 44 to 76), other (n=114) 48% (95% CI 31 to 66), ulcerative keratitis (n=195) 41% (95% CI 26 to 56), other infection (n=195) 38% (95% CI 27 to 48) with p<0.0001 (log-rank test). Patients receiving their first eCG that had not failed were able to achieve visual acuity of 6/12 (20/40) or better in 30% of the eyes, 6/18 (20/50) to 6/60 (20/200) in 38.4% and only 30.6% had visual acuity of less than counting fingers at 1 m. In this group, vision improved in 90% of the patients and in 60% improved by more than five Snellen lines with only 1% of patients unable to recover any vision. Overall, following eCG the vision decreased in only 26 patients (8.7%) with both surviving and failing grafts achieving a postoperative improvement in vision. However in eCG the graft rejection rate is higher and depending on indication it can increase up to 32.1% in 4.4 years.36 In our study this was 4.2% in the first year. In our study, HLA matching was carried out in 823 (7.1%) elective CG and 44 (3.3%) eCG with just over 50% of them performed for regrafts. Previous studies have successfully argued that HLA matching does not appear to have a significant effect on corneal graft survival in elective CG patients.37 However, there is a strong consensus among clinicians that this may not be the case in eCG where there is a breakdown of corneal immune-privileged status. A vascularised corneal graft bed, along with a concurrent corneal infection and/or inflammation, promotes the induction of alloimmunity and jeopardises graft survival. Therefore, there may be a role for HLA matching in eCG surgery. The prolonged use of postoperative systemic/topical immune suppression and antiviral treatment regimens may be beneficial in eCG, however, they need to be evaluated with further studies. Our study provides demographic, clinical and surgical factors that show the outcome of eCG surgery, and this information can be used to counsel corneal transplant patients about the long-term outcome of their surgery. This study reinforces the importance of eye banking and provision of emergency corneal graft material, confirming that eCG is a successful sight-saving operation. The authors gratefully acknowledge the voluntary contribution of records by over 500 ophthalmologists and other practitioners across the UK.
. 1998. Towards Standards for Organ and Tissue Transplantation in the United Kingdom. Richmond Surrey TW9 1GJ: British Transplantation Society. NHS, Blood and Transplant. 2013. Organ Donation and Transplantation: NHS Blood and Transplant. Activity report. 75-83.
. 2000. Australian Corneal Graft Register 1999, 2000 Report Adelaide.
. Conclusions of the corneal transplant follow up study. Collaborating Surgeons. Br J Ophthalmol 1997;81:631–6.
. [Urgent penetrating keratoplasty in perforated infectious corneal ulcers]. J Fr Ophtalmol 2005;28:267–72.
. Outcome of therapeutic penetrating keratoplasty in infectious keratitis. Ophthalmic Surg Lasers Imaging 2005;36:303–9.
. Eine erfolgreiche totale Keratoplastik (A successful total keratoplasty). 1906. Refract Corneal Surg 1989;5:258–61.
. Critical evaluation of therapeutic keratoplasty in cases of keratomycosis. Ann Ophthalmol 1991;23:373–6. Contributors PH: contributions to the conception or design of the work; the acquisition, analysis or interpretation of data for the work; drafting the work or revising it critically for important intellectual content; final approval of the version to be published; agreement to be accountable for all aspects of the work in ensuring that questions related to the accuracy or integrity of any part of the work are appropriately investigated and resolved. AKT: interpretation of data for the work; drafting the work or revising it critically for important intellectual content; final approval of the version to be published. DK: interpretation of data for the work; drafting the work or revising it critically for important intellectual content; final approval of the version to be published. MJ: contributions to the conception or design of the work; the acquisition, analysis or interpretation of data for the work; final approval of the version to be published. DA: interpretation of data for the work; drafting the work or revising it critically for important intellectual content; final approval of the version to be published. Ethics approval UK Blood and Transplant approved this study.